And of course no item about Lehrer in a music blog would be complete without mention of one of his least political but most delightful songs - Alma. I first heard it when I was starting university and had just bought my first Mahler recording (the Cleveland/Raskin/Szell 4th). I remember being fascinated to discover that Alma only died the previous year. Thanks Scott for that email, which sends us down another fascinating path. My header photo shows Alma and Gustav Mahler in Basle at the time of the performance of the composer's Second Symphony there in 1903. 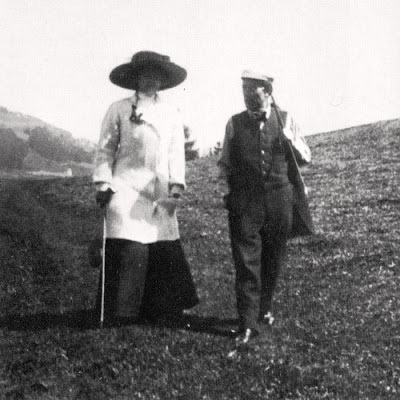 The photo below shows the couple walking between Toblach and Altschluderbach in 1909. There are very few photos of Alma and Gustav together, which may not be surprising once you've heard Tom Lehrer's song. Below are the lyrics for Alma together with the top and tail Lehrer gave it on his 1965 album That Was The Year That Was. Finally there is a recording of the great Tom Lehrer himself singing Alma. Last December 13th, there appeared in the newspapers the juiciest, spiciest, raciest obituary that has ever been my pleasure to read. It was that of a lady name Alma Mahler Gropius Werfel who had, in her lifetime, managed to acquire as lovers practically all of the top creative men in central Europe, and, among these lovers, who were listed in the obituary, by the way, which was what made it so interesting, there were three whom she went so far as to marry. One of the leading composers of the day: Gustav Mahler, composer of Das Lied von der Erde and other light classics. One of the leading architects: Walter Gropius of the Bauhaus school of design. And one of the leading writers: Franz Werfel, author of the song of Bernadette and other masterpieces. It's people like that who make you realize how little you've accomplished. It is a sobering thought, for example, that when Mozart was my age he had been dead for two years. It seemed to me, I'm reading this obituary, that the story of Alma was the stuff of which ballads should be made so here is one. From the day she began her -- beguine. "Ach, that is the fraulein I moost have!" Gus died, and her tear drops were copious. She said, "What am I running? A chow house? It's time to change partners again." And he too was caught in her net. I know some people feel that marriage as an institution is dying out, but I disagree and the point was driven home to me rather forcefully not long ago by a letter I received which said: "Darling, I love you and I cannot live without you. Marry me, or I will kill myself." Well, I was a little disturbed at that until I took another look at the envelope and saw that it was addressed to occupant. Speaking of love, one problem that recurs more and more frequently these days in books,and plays,and movies on, is the inability of people to communicate with the people they love. Husbands and wives who can't communicate; children who can't communicate with their parents, and so on. And the characters in these books, and plays, and so on, and in real life, I might add, spend hours bemoaning the fact that they can't communicate. I feel that if a person can't communicate the very least he can do is to shut up. Now read about Mahler's forgotten assistant. The French writer & journalist Françoise Giroud did not only write a book on Cosima, but on Alma as well. 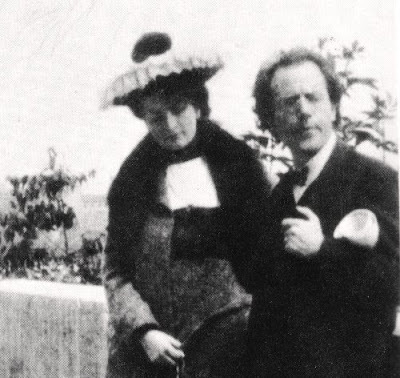 All details about the way she “ played” with Mahler making use of her relationships with other great men like Franz Werfel, Gropius, KoKochka, a priest, etc. etc. She was very arrogant & selfish. "Tu n’ as dsormais qu’ une profession : me rendre heureux” G. Mahler demande à Alma Schindler de renoncer à toute ambition. Elle l’ aime. Elle accepte. Elle épouse le grand compositeur. ….Peu douée pour l’ abnégation cette femme belle , jeunr, talentueuse, promise à un brillant avenir de musicienne, se révolte. Frustrée , elle devient cruelle. Mahler lui vole sa vie. Il le paiera cher. Il mourra de l’ avoir Aimée." Good book. Translated in 4 or 5 languages ( EN as well).